The statute is a celebration to those workers who've lost their lives. 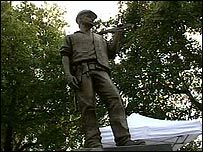 A bronze statue which celebrates the lives of workers killed on building sites has been unveiled. About 200 people gathered in Tower Hill in the City of London as the £100,000 "Building Worker" was uncovered. The Union of Construction, Allied Trades and Technicians (Ucatt) had the sculpture made as part of a campaign for a new corporate killing charge. Sculptor Alan Wilson created the figure which sports a hard hat, weighs 300kg and holds a spirit level. Ucatt general secretary Alan Ritchie unveiled the sculpture, which is close to the Tower of London, during a ceremony on Wednesday. A total of 351 construction workers have died on sites since 2001 and a two-minute silence was observed in their memory. Mary O'Sullivan's husband died building the new Wembley Stadium. Watching the unveiling was Mary O'Sullivan. 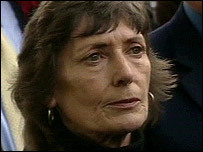 Her 54-year-old husband Patrick O'Sullivan was working on the new Wembley Stadium in 2004 when he was killed. The cause is still not known and a criminal prosecution has not been ruled out. "He was crushed to death that morning," she said. "And they crushed us to death as well." Mr Ritchie said: "Our union will continue campaigning for a new law so that individual directors and senior managers are held accountable for accidents at work," he said. It is hoped wreaths will be placed by the statue each year on 28 April which is Workers' Memorial Day.